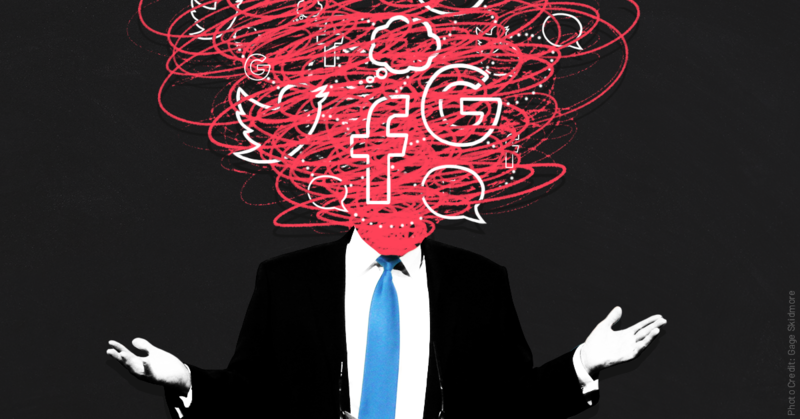 Blog ››› April 10, 2019 11:01 AM EDT ››› CRISTINA LóPEZ G.
Allegations that social media companies are biased against conservatives and censoring right-wing content have become a common narrative on right-wing media and, ironically, recurrent content on the same social media platforms the narrative targets. These claims are just another iteration of the long-term right-wing effort to brand most of the mainstream press as biased against conservatives in an attempt to “work the refs” and get favorable treatment, this time applied to tech giants. But many of the episodes used to push allegations of censorship or bias can actually be explained through technical arguments in which political motivations play no role. And that showcases, at best, a preoccupying level of digital illiteracy among those making the allegations and, at worst, the inherent bad faith of these claims. As explained previously by Media Matters’ Parker Molloy, this playbook has been working for conservatives for over half a century, at least since “Republican presidential nominee Barry Goldwater gave reporters covering his campaign pins that read ‘Eastern Liberal Press.’” The strategy of putting the onus of proving neutrality on the mainstream press worked -- media have since over-represented conservatives, engaged in false equivalences, offered platforms to far-right hacks in the name of balance, and prioritized negative coverage of Democratic politicians -- and the same playbook is now being applied to tech giants. This, too, seems to be working: These platforms have groveled in response to accusations of bias by tapping extremist figures and far-right grifters as advisers or by having their leadership appear on right-wing propaganda shows to appease right-wing audiences. Moreover, in what seem like efforts to avoid accusations of right-wing content censorship, tech platforms have let racism proliferate undeterred, making social media both an unsafe space for members of vulnerable communities and a valuable tool for dangerous far-right radicalization and recruitment. A conservative site complained of bias because autocomplete search results on Google didn’t show the lack of new indictments stemming from the Trump-Russia investigation, ignoring the platform’s autocomplete policies against character denigration. As Media Matters’ Parker Molloy pointed out on Twitter, right-wing site Washington Free Beacon accused Google of bias against President Donald Trump because its search bar autocomplete results didn’t point users to the news that there had been no new indictments related to the special counsel investigation on Russian interference in the 2016 presidential election. Google search liaison Danny Sullivan directly addressed the complaint, explaining that to avoid character denigration, the platform’s autocomplete policies specifically avoid offering predictions that contain “indictment” next to a person’s name. Sullivan had to reiterate his explanation after Washington Free Beacon promoted its article again without clarifying political bias was not playing a role in the autocomplete results. Those alleging that a temporary loss of Twitter followers was indicative of the platform’s bias against anti-abortion movie Unplanned failed to understand Twitter’s “ban evasion” mechanisms. On April 1, a number of right-wing media figures and politicians accused Twitter of deliberately censoring anti-abortion movie Unplanned after the Twitter account for the movie lost followers temporarily. As explained by NBC’s Ben Collins, Twitter responded that the temporary loss of followers wasn’t about the Unplanned account itself, but came because an account linked to the Unplanned account had violated Twitter rules, triggering the platform’s automated “ban evasion” mechanisms, which aim to limit users banned from the platform from coming back by using alternative accounts. As Collins pointed out, Twitter’s ban evasion systems identify accounts that could be linked in different ways, including by shared IP or email addresses. Shortly after, Twitter manually overturned the automated system and restored the Unplanned movie account, noting that follower counts can take time to replenish. Here's my stab at a Human English version of what happened with the abortion movie conservative censorship campaign on Twitter. Conservatives incorrectly interpreted temporary account activity limitations meant to stave off inauthentic, spammy activity as censorship. Platforms are known to limit the number of comments or likes single accounts can make in a determined period of time to stave off spam, automated behavior, and inauthentic activity; authentic accounts managed by real people can be affected by these limitations whenever their behavior matches automation patterns. Reportedly, different limits apply to different accounts depending on how old they are. Yet Donald Trump Jr. and White House social media director Dan Scavino have claimed they’re being censored when this has allegedly happened to them. There have been accusations of “#censorship” based on “a crazy drop in new followers,” but there are unrelated reasons for altered follower counts. Trump Jr. has also claimed that drops in followers or stagnant follower counts amount to “#censorship.” However, Instagram has experienced glitches that have affected follower counts for many accounts, and the platform’s policies that aim to reduce inauthentic activity have in the past caused account purges that result in diminished follower counts for users displaying automated behavior. President Donald Trump made a similar accusation against Twitter, claiming to have lost followers. As Mashable pointed out, users across the political spectrum lose followers as a result of purges, or removals of “inactive accounts and fake profiles.” In fact, a Twitter purge in the summer of 2018 cost former President Barack Obama more followers than Fox’s Sean Hannity. A Republican lawmaker complained that a Google search mainly returned negative results about unpopular Republican legislation, saying it was evidence of bias, but in fact it was likely reflective of an overwhelming amount of criticism. During a December 11 hearing before Congress, Rep. Steve Chabot (R-OH) cited “a firsthand experience” to ask Google CEO Sundar Pichai why the first few pages of results he found on Google about the Republican bill to repeal the Affordable Care Act showed so much negative criticism. Chabot also questioned why the majority of results of Google searches for the Republican tax cuts criticized them as favoring the rich. As Pichai explained, search results are not based on political ideology. What Chabot seemed to not understand was that Google search returns are actually based on rankings (a site that is ranked high appears higher on search results) that depend on factors like domain authority, which is calculated by the number and reliability of sites that link to it, among other things. Which is to say, negative results are evidence that sites with high domain authority are referring to the search term in negative ways -- something that has more to do with the substance of the search term than the search engine itself. Another legislator complained to Google that an iPhone displayed negative language about him, implying it was evidence of Google’s bias, but the phone was manufactured by Apple. During the same December hearing in which Google’s Pichai testified, Rep. Steve King (R-IA) -- whose extremist record includes explicit endorsements of white supremacists -- complained that his 7-year-old granddaughter had been exposed to negative language about him on her iPhone. King said, "And I’m not going to say into the record what kind of language was used around that picture of her grandfather, but I’d ask you: How does that show up on a 7-year-old’s iPhone, who’s playing a kids game?” As Pichar said, Google does not manufacture iPhones; Apple does. Moreover, even if the hardware in question had been a Google-manufactured Android, King’s complaint displayed his own digital illiteracy more than any possible tech platform bias directed against him. PragerU alleged that removal of far-right content on platforms was based on “deliberate censorship of conservative ideas,” but an expert found “plausible, non-ideologically motivated explanations” for the removal. After online propaganda machine PragerU accused platforms of “deliberate censorship of conservative ideas” for removing PragerU videos (and then reinstating them after admitting a mistake), an expert “reviewed several of the videos” and found explanations for their removal that had little to do with political bias. As Data & Society’s Francesca Tripodi explained, some videos contained language that could have been picked up by platforms’ automated systems and then -- when reviewed by third-party moderators that are sometimes outsourced to the Philippines -- the reviewers placed more importance on the specific language than on the political substance of the video. Tripodi also pointed out that the platforms’ lack of process transparency could have contributed to right-wing cries of censorship and bias. Right-wing outlets affected by a Facebook purge claimed it was evidence of anti-right-wing bias. In fact, it was evidence of spammy behavior. Right-wing outlets claimed that the removal of right-wing content pages showed Facebook was biased against the right. Yet Facebook explained in an October 11 blog post that the reasoning behind the removal of over 800 pages and accounts was based on user violations of the platform’s rules against spam and “coordinated inauthentic behavior.” According to Gizmodo’s report at the time, Facebook pointed out that while the spammy behavior the platform targeted for removal seemed financially motivated, the pages were “at least using political content to drive traffic to their ad-supported websites.” Prominent amplification networks of right-wing content were affected by the purge -- but it was because the pages were in violation of the platform’s guidelines regarding “coordinated inauthentic behavior,” which had nothing to do with the pages’ political alignment. An allegation that Facebook “deboosts” right-wing content was not supported by hard evidence. A Media Matters study found right-wing political pages and left-wing political pages on Facebook have about the same amount of interactions. Donald Trump Jr. has devoted media appearances and columns to pushing generalized claims of censorship from Big Tech. In a March 17 column published by The Hill, Trump Jr. pointed to Facebook documents published by serial bullshitter James O’Keefe to allege that the site targeted conservative posts for “deboost”-ing. A new Media Matters study of content from 395 Facebook pages that regularly post about American political news between July 2, 2018, and March 17, 2019, shows that not only did left-leaning and right-leaning pages have roughly the same engagement numbers, but -- between January 14 and March 17, the weeks leading up to this new wave of conservative censorship claims -- right-leaning pages on average actually received more interactions than left-leaning pages. Alex Kaplan and Natalie Martinez contributed research for this piece.